If the shockingly misleading trailer for Le Week-End makes you want to see the movie, don’t. It is not, as you may have been led to believe, a romantic frolic about an aging couple rekindling their romance in the city of lights. Quite the opposite. It’s a dark and depressing drama about a marriage in horrible decline. I can’t blame the film for bad marketing. But I can blame it for it’s own faults. While Le Week-End has several very good scenes and one fully-realized, interesting, and sympathetic lead character, it suffers from a overly manipulated story and another lead character so despicable as to be unbelievable. The result provides sadness without insight. The plot is reminiscent of the Before… trilogy (Before Sunrise, Before Sunset, and Before Midnight), and yet feels far more contrived. 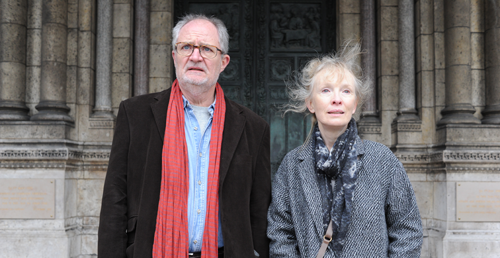 On their 30th anniversary, a very unhappy English couple go to Paris for a weekend. Whether they even hope it will rekindle something seems unlikely. What empathy the film offers goes entirely to Nick (Jim Broadbent), a man of deep insecurity coming to the end of his rope. He’s lost his job and is running out of money. Age is delivering one new physical pain after another. His wife treats him with contempt, and their son has become a father without growing into responsible adulthood. That wife, Meg (Lindsay Duncan) , is horrible. She refuses to stay in the modest hotel where they have a reservation, and insists on going to the most expensive place in Paris–despite their serious money problems. She insults him, flirts then rejects him, and argues about everything. When he falls on a cobblestone street and lies there in pain, she walks away. Why doesn’t Nick simply divorce her? He can’t afford to. Halfway though the film, they run into an old, once-very close friend of Nick’s (Jeff Goldblum), who somehow never met his wife of 30 years. This chance meeting leads to an insufferable party filled with annoying intellectuals. A series of toasts at the dinner table become of the film’s climax, where the main characters stand up and express their feelings out loud to strangers. The film has a few light-hearted moments, and even a few comic ones. Occasionally, Nick and Meg appear to actually love each other in some strange way. But these moments never last. The entire cast give excellent performances, but only Broadbent is well-served by the script. His character is the only reason to see this film. A lot of talent went into Le Week-End. Very little of it shows.